Displays information and update notification options for the Genesis Framework. I would recommend to keep the Enable Automatic Updates checked. It´s possible add your email address in the “Notify” field to get notified immediately whenever there is an update available. Depending on your child theme, you can select different color schemes for your website or blog. You can select the color style from the drop-down menu depending on your taste and requirements. For example, Natalie Theme has four color schemes ( Coral, Navy, Green and Blue). Allows you to redirect your RSS feed URLs if you’re using a feed delivery service. By default, ever WordPress site has two different feeds, i.e. general feed URL for the blog posts and a comment’s feed for any comments on your site. Genesis supports feed redirection Feedburner and Feedblitz services. For example, I’m using Feedburner for RSS Feed. You can determine your layout for post, pages and archives. Depending on the theme you’re using, it may override this setting for the home page and alternative settings can be used on a per page, post, or archive basis. The default Sidebar, Content Layout will be set by default in most themes. Breadcrumbs can be a useful navigation device to display on different content types to guide visitors back, incrementally, to your home page. I recommend you turn breadcrumbs on Single Posts if you have a large blog with lots of categories. Content archives control the display of your content on archive pages. This option enables you can display excerpts, content limited or full content on your custom blog page. If you change this configuration, install ‘Regenerate Thumbnails‘ plugin and run the tool to regenerate these Image featured images. If you use the Entry Content setting with 0 Characters limit, do not tick the “Include Featured Image” box. This avoids displaying duplicate images on your blog listing pages. Controls the display options for Pages that use the Blog Page Template; Categories and post per page. NOTE: This affects the number of blog posts that display on the Genesis Blog Page Template NOT on your front page. Header and Footer scripts are often used for statistical tracking scripts. For example, if you want to use Google Analytics, you can paste your tracking code into header or bottom. 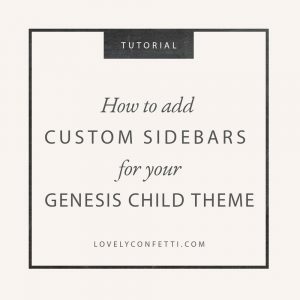 Now, I hope you you practice and enjoy with the different settings and customize them to suit your own Genesis Child Theme!. this fantastic read!! I definitely appreciated every bit of it and i also have you book marked to look at new stuff in your blog.